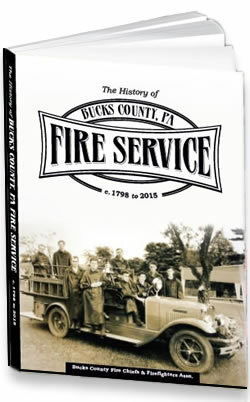 The History of the Bucks County Fire Service is a publication of the Bucks County Fire Chiefs and Firefighters Association. It contains 390 pages, including the written history, pictures and an all-time list of fire apparatus of each of the 62 county volunteer fire companies in full color. There are four additional fire companies presented who no longer exist, including the very first, Reliance Fire Co. of Bristol. A list of the 153 Philadelphia Volunteer Fire Companies from 1736 until 1871 is included along with those companies who transitioned into the paid Philadelphia Fire Dept. Also included is a list of the 29 Bucks County Firefighters who lost their lives in the line of duty. Many of the fire companies in Bucks County obtained their first piece of firefighting equipment from a Philadelphia Volunteer Fire Co. when they were upgrading and sold off an old piece of fire equipment. This “hand-me-down” process helped lessen the cost to become an established firefighting force. It also established the roots of the Bucks County volunteers with the Philadelphia volunteers and their Fire Chief, Ben Franklin. Amazingly, today’s Bucks County Fire Service continues as a volunteer service to provide fire and rescue services to the 650,000 citizens of Bucks County. Books are NOW available for $25.00. They can also be purchased at Parkland and Hartsville Fire Stations on Tuesday nights from 7 pm until 9 PM, at the Perkasie station on Saturday mornings from 9 AM until noon and at the gift shop at the Mercer Museum in Doylestown, PA. Books can also be shipped for a Shipping and Handling charge of $4.50. If you would like to order one or more books online using a secure payment method you can use our PayPal link and in just a few clicks the book(s) can be purchased and shipped to you directly. Click the button below to take you directly to the purchase page. Thank you and we hope you enjoy The History of the Bucks County Fire Service.